Be bold with a marker. Indelible ink that packs a punch. 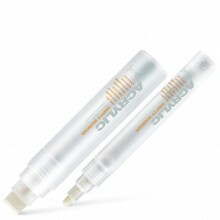 Marker pens tend to be permanent and most will work on any surface. Great for dynamic artwork. Available in a 15mm Standard/Flat tip, an 8mm Round tip, and a 10mm Chisel tip.